The recent visit from members of The Fuller Center for Housing (FCHA) to our soup kitchen in Nor Nork was a nice surprise. 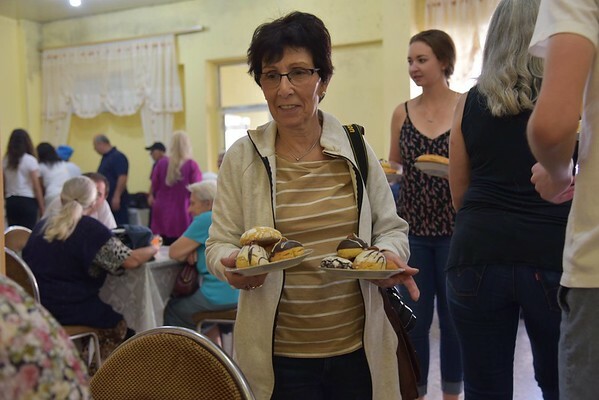 Upon arrival, the group’s members, who never miss an opportunity to visit one of FAR’s project sites when they come to Armenia, greeted beneficiaries with affection, along with sweets and cookies in tow. They got straight to work serving the kitchen’s 170 daily visitors. Beneficiaries approached them throughout the meal; many tried to thank them in English. The day brought joy to Sona’s fellow group members as well. We are so thankful to our friends at FCHA for making the continuous effort to bring positive changes to the lives of our beneficiaries each time they are in Armenia.